# Outdoor natural fields – grass fields, in particular – can easily deteriorate due to adverse climatic conditions. As a result, games and matches are often cancelled or hindered. 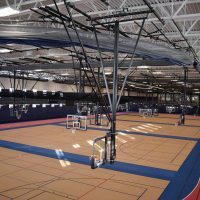 # Indoor athletic fields are well protected from the whims of the weather but do not get enough sunlight for grass to thrive. Present-day technology has provided the perfect solution – an artificial surface that looks and performs like grass, but is not vulnerable to the elements. Synthetic sports turf, also known as artificial grass for sports, is manufactured from synthetic fibers and made to imitate natural grass. It is generally used to provide an adequate surface for sports that are normally played on grass in areas where grass cannot grow or is too difficult to maintain. Artificial turf is used mainly in sports stadiums and arenas, but can also be found on playgrounds, residential lawns, and various other spaces. Artificial sports turf first gained attention in 1966, when AstroTurf – a short-pile synthetic turf – was installed in the newly-built Astrodome in Houston, Texas. The stadium had a covered baseball field of natural grass and was built with a transparent roof in order to provide enough light for the grass to grow. 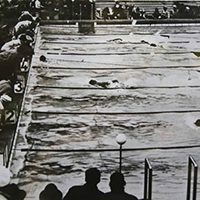 The glinting of the sun on the transparent ceiling panels, however, impeded day-time games, so the roof was painted to solve the problem. This reduced the amount of sunlight the grass in the covered stadium received and it couldn’t grow properly. An alternative solution was urgently needed, so the stadium owners and engineers decided to try a new artificial playing surface called ChemGrass that was fist installed at Moses Brown School in Rhode Island in 1964. The “grass carpet” made from nylon fibers proved to be a huge success. The brand name ChemGrass was changed to AstroTurf and the product rapidly gained popularity – first in the United States and Canada, then in Europe. In the early 1970s, AstroTurf became widespread and led to a boom in closed and domed sports arena construction around the world. The nylon fibers were replaced by polypropylene – a cheaper material that is also softer than nylon and poses a smaller risk of injury to the players. These closely packed turf systems with short-pile fibers (both nylon and polypropylene) are known as the first generation synthetic turf. Surface temperatures got very high during hot sunny days, as the artificial turf didn’t have the same cooling effects as natural grass. In response, a new generation of synthetic turf was developed – it had longer tufts that were spaced more widely apart and sand was spread between the fibers for greater firmness. This provided a flatter playing surface which gave the players better control over the ball and prevented it from shooting off in unexpected directions. Though it was very suitable for sports like field hockey, this second generation artificial sports turf, still couldn’t compare to natural grass – the playing characteristics and behavior of the ball was not “right” for football and baseball; an arm or leg driven along the unyielding surface resulted in painful abrasion injuries from the sand; etc. So, by the early 1990’s many sports arenas had converted back to natural grass playing fields. The problems with natural turf systems (difficult maintenance, need for abundant sunlight, risk of deterioration in adverse weather conditions), however, remained. 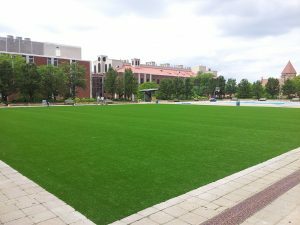 Therefore, when recent developments in the artificial turf industry allowed the creation of grass blades supported by an infill material so that the grass would not compact, artificial turf quickly regained its popularity – unlike natural grass fields, it offered a surface that was easy to maintain, did not require sunlight, and had a drainage system. The turf systems feature mixtures of sand and rubber granules – when spread between the grass blades, this infill provides stability for the players, gives better ball control, and creates cushioning for the athletes which helps prevent injuries. As a result of these innovations, the performance of synthetic turf surfaces during play has become very similar to real-grass fields. 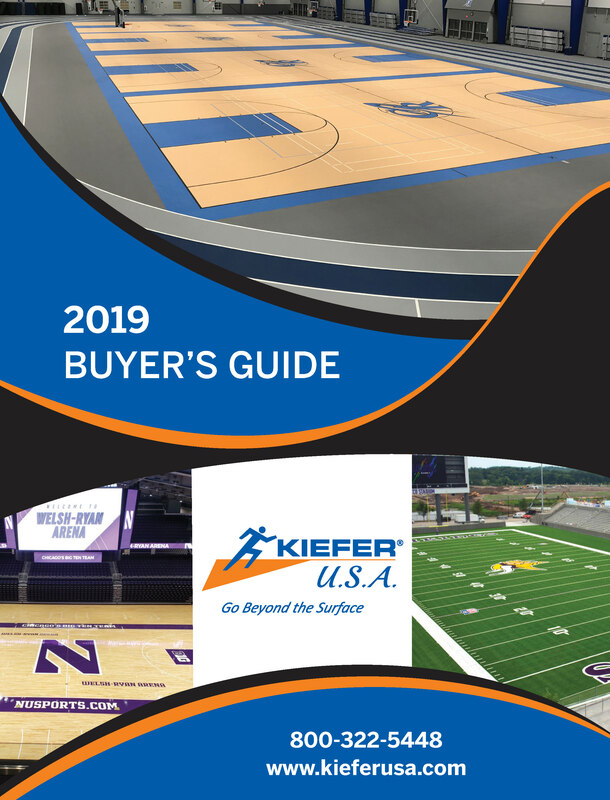 The engineering and design of artificial turf is constantly improving and evolving, so it will certainly continue to be the surface of choice for many indoor and outdoor sports facilities in the future. There have been a number of studies evaluating the risk of strains, tears, fractures, and concussion when playing on artificial sports turf. All the research concluded that the risk of injuries was the same as when playing on natural grass and confirmed the safety of synthetic grass for athletes. All and all, sports fields are hardier and more versatile when synthetic grass is used. Artificial turf is suitable for all kinds of sports, but it is most often used for baseball, football, soccer, lacrosse and rugby. 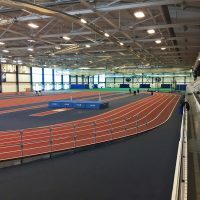 Many track and field events also take place on a synthetic grass field. 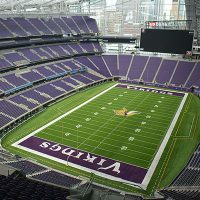 Artificial turf is the best option for covered stadiums (because of the difficulty of getting grass enough sunlight to stay healthy) and outdoor sports arenas (because it allows games to be played in any type of weather). 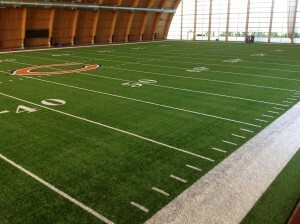 If you wish to take advantage of the numerous benefits of artificial turf, do not hesitate to call the professionals at Kiefer USA – we will provide you with all the necessary information and will discuss the details of your synthetic turf design and installation with you, so that you get the best artificial surface for your sporting needs at the most reasonable price!